The word ‘remote’ is often used to describe Rhenigidale – for it is approached by a long single-track road from the junction on the A859 or by an arduous walk from the Scalpay – Tarbert road. However, throughout most of its occupation people and goods came by sea. 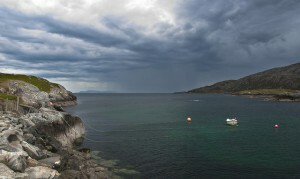 This bay was once busy with small boats plying their way towards Loch Seaforth and the coastal settlements of The Pairc. It was more of a hub and certainly not a backwater.